Alex Ross is like the human version of DC's orange lantern Corps. Every time you see art by the superstar painter, you instantly want more. For me, no piece by Ross drives that desire more than the one below, and today Marvel announced more was finally on the way. 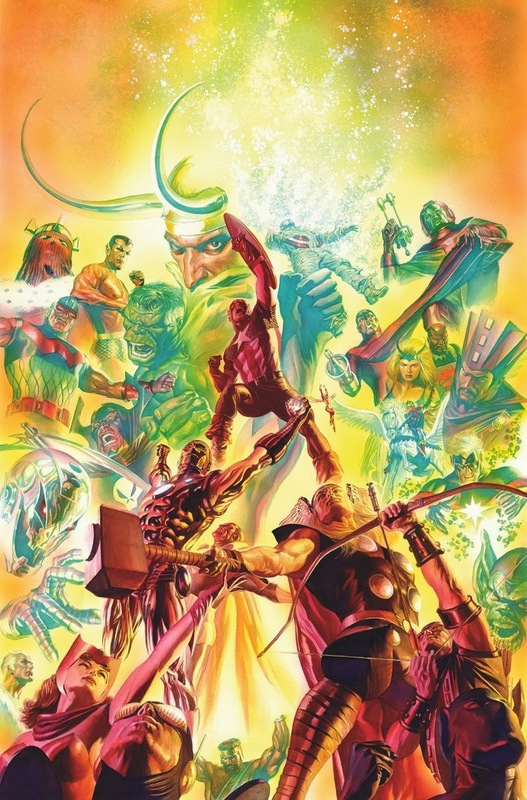 With the above a bookend to Ross's infamous JLA right-facing composition of a similar nature, many felt Ross's time at the Marvel had also reached its 'bookend', with the artist furrowing himself away at Dynamite Entertainment for the last wee while, bringing his talents to Kurt Busiek's Kirby, Doc Savage and more. While that work has been no less stunning, Marvel's announcement today that he's returning to the company that largely put him on the map (oddly enough with Busiek again in Marvels), to help them celebrate their 75th anniversary with a range of covers, is like putting on your favourite slippers after fearing them lost. Including their Timely days in the age, Marvel say the twelve covers will run throughout 2014, showcasing various characters and starting with January's Avengers #25.
Who would've guessed the top spot would go to Captain Marvel in her energy form? One of those 'every time you look at it you find a different character' jobbies, it really shows Marvel + Alex Ross is the definition of Earth's mightiest assembling. Thanks Eric! I was meaning Monica humourously but glad it has a factual reason too.